Looking at the Western Division standings about one-third of the way through the 2018 SHL season, one thing is clear: the Michigan Gray Wolves are the overwhelming favorites to win the division title. They’re already 12 points clear of their nearest competitor and are outscoring their opponents by nearly a 2-to-1 ratio. Goaltender Dirk “The Bear” Lundquist and the defense remain as stingy as ever; even a serious injury to top blueline “Mad Max” Madison has barely slowed the Wolves down. Michigan seems well on its way to nailing down that top spot. But there are two playoff spots in each division this season. And if first place appears all but sewn up, second place is up for grabs. No team is out of the running, and no team seems to have much of an edge at this stage. 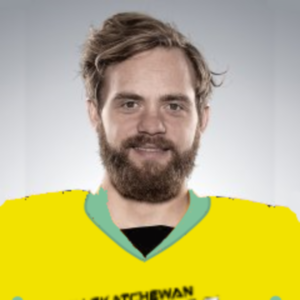 Two points behind Anchorage are the Saskatchewan Shockers, who look ready to shake their hapless reputation. They had a shot to take over sole possession of second place on Friday, but dropped a 5-2 decision to the Igloos. The key to the Shockers’ success this season has been their defense. Coach Myron Beasley has made a point of tightening up his team’s play in its own end, and his efforts are paying dividends. Saskatchewan is limiting opponents to 29.3 shots per game, the fourth-best total in the league. The improved defense has been a blessing for goalie Zeke Zagurski, who has historically faced a barrage of enemy shots on a nightly basis. This season, he’s lowered his GAA to 2.52 while stopping shots at a .919 clip. Backup Shawn Stickel has been even better in limited action, compiling a stingy 1.33 GAA and .929 save percentage. Saskatchewan is one point up on the Seattle Sailors, who are the Shockers’ mirror image. The Sailors have a potent attack, having scored 75 goals already this season, led by RWs Elliott Pepper (13 goals) and Vince Mango (11). However, their fast tempo and aggressive approach has led to a vulnerability on defense. Seattle has given up 82 goals, the highest total in the league. Part of the issue is their tendency to allow odd-man rushes (they’re allowing 37 shots per game). They’re not getting much help between the pipes, either. The Sailors have rotated between Rocky Goldmire (6-7-0, 4.12 GAA, .893 save percentage) and “Jersey Mike” Ross (3-3-1, 4.00, .883); neither has done enough to nail down the starting job. “We need to spend a little less time on the fun stuff and a little more on the lunch-pail, building-block stuff,” said Sailors coach Harold Engellund. One point back of the Sailors are the Dakota Jackalopes, having a bit of a surprising season under new coach Flim Dahlgren. The Jackalopes had a good deal of success during the inter-divison round last week, winning five in a row against the East. They’ve come back to earth this week, dropping three of their last four. But for a team that’s widely assumed to be in a rebuilding mode, Dakota has been surprisingly competitive. They’re getting a boost from two of the only remaining veterans on the team: C Lars Karlsson (tied for the team lead with 11 goals) and D Matt Cherner (whose 19 assists). Karlsson and Cherner are widely assumed to be top targets at the trading deadline; if the Jackalopes remain in contention, GM Paul Mindegaard may have some difficult decisions to make. It’s fair to say that the second half of this season was a disaster for the Saskatchewan Shockers. After a surprisingly strong 14-15-1 record in the first half, the Shockers collapsed in the second half, posting a 7-23-0 mark. That record included a pair of seven-game losing streaks. Their late-season misadventures ranged from a stick getting wedged in the boards to a pair of players getting arrested after taking a joyride at the airport. Their dismal half came to a suitably disappointing close, as the Shockers stumbled through a memorable final week. The week began on an embarrassing note, as the Shockers lost in overtime to the SHL’s worst team, the expansion Seattle Sailors. The win allowed Seattle to tie last year’s Shockers for the fewest-ever points recorded in a season with 23. (The Sailors did wind up setting a record for fewest victories, finishing with 10 vs. the Shockers’ 11.) Seattle won only two of its final 27 games; both were against Saskatchewan. After the game, Beasley called the loss “kind of humiliating, to tell you the truth.” Little did he know how much worse it could get. On Tuesday, the Shockers watched Michigan outshoot them 42-18 and clinch the West division title with a 3-1 win. In many ways, it was the highlight of the Shockers’ week. “At least we got to see someone having a good time,” said RW Brad Stevens. The next night, the Shockers were in Anchorage, and Stickel was back in net. The result was another thumping, with the Igloos winning 8-2. Stickel’s last two calamitous outings swelled his GAA from 4.61 to 5.29. “I think I’m kind of going deaf from the goal horn going off in my ear so many times,” he said after the Anchorage fiasco. The Shockers closed out the season at home, and managed to salvage a shred of dignity, beating an imploding New York team 6-4. But even in victory, Saskatchewan lost. The win dropped the Shockers out of the second spot in the draft, allowing them to finish a single point ahead of Quebec. In a shallow draft, the slip could cost the Shockers dearly. A pair of Saskatchewan Shockers found themselves in hot water this week after a mischievous prank at the airport went awry. The Shockers were feeling pretty punch at the end of a long flight home from Quebec on Friday night after toppling the Tigres 4-2. The second half of the season has been a slog for Saskatchewan; after getting off to a better-than-expected 14-15-1 start, the team has lost 15 of 20 since. So it’s little surprise that players might be looking to blow off some steam. As they were leaving the plane, C Foster Culp and backup goalie Shawn Stickel decided to have a little fun. They slipped down the stairs from the jetway, snuck onto the tarmac, hopped into the baggage tractor, and went for a joyride. They were on the loose for about 10 minutes, merrily eluding airport personnel, but were ultimately stopped by a blockade before they could make it onto the runway. The kerfuffle caused a 30-minute ground stop at the airport, in order to avoid endangering passengers. After being stopped, Culp and Stickel were taken into custody by airport security, and after questioning were detained overnight by the Saskatchewan police. Coach Myron Beasley bailed the pair out the next day. “Needless to say, alcohol was involved in the incident,” Beasley said.